We are excited to share that Central Maine Human Resources Association was recently recognized for three awards. SHRM awarded the prestigious EXCEL Gold Award for the chapter’s accomplishments in SHRM EXCEL 2017. The awards aligns individual chapters’ and state councils’ activities with SHRM’s aspirations for the human resources profession. The award recognizes accomplishments and strategic activities and initiatives that enhance the human resources profession. 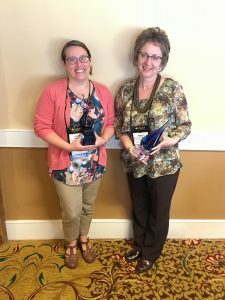 Two CMHRA Board Members were recognized by the SHRM Maine State Council for its top two leadership awards at the Maine Human Resources Convention in Rockland on May 8. Mary LaFontaine, CMHRA President, was awarded Maine HR Leader of the Year and Carrie Bolduc, CMHRA Communications Director, was awarded Maine HR Volunteer Leader of the Year.